33 Champagnes is a sparkling wine journal that provides an easy way to quickly record tasting notes in a small, convenient notebook format. It’s perfect for all types of sparkling wine, including Cava, Prosecco, Sekt, and of course, Champagne. This champagne journal is designed for ease of use. It’s tough to hold a notepad in one hand, a pen in the other, and have another hand left for your glass. Taking notes with 33 Champagnes is as simple as checking a few boxes and entering a few basic facts. The flavor wheel in 33 Champagnes can be used to quickly recall a wine’s unique flavor long after consumption. For low values of the flavor, fill in dots near the wheel’s center. A French Premier Cru Blanc de Blancs is used in the example shown. Like a fine wine label, the cover of the Champagne journal is adorned with an attractive gold foil and embossed “rising bubble” texture inspired by the high-quality wines this journal is meant to memorialize. 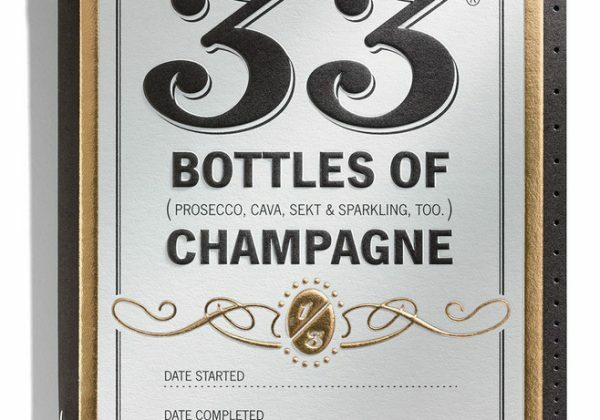 33 Champagnes is made with 100% recycled papers. The booklets are printed using soy-based inks in sunny Portland, Oregon.